I was pretty excited to work with this cute CottageCutz Beaver, I mean what's not to love about this darling little critter? 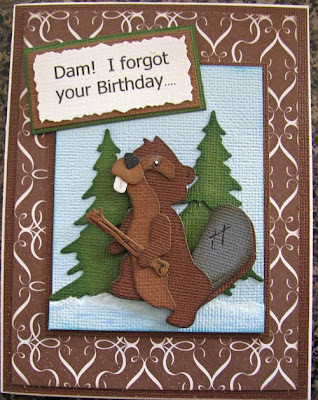 I kept trying to come up with one for this beaver and then it hit me and made me smile pretty big. Remember I'm only swearing if it has a "n" at the end LOL! I also used the new CottageCutz Pine Tree Forest for my background. You've got to love these trees, you can make them 4 different sizes to meet your scrappy needs, all on one die. Cute Card. What a darling beaver. I love thepine trees in the background. Both the beaver and the pine trees are great dies. I can't wait to get them. Too funny, Kay!!! I have the beaver shape also and I can't wait to use him! These woodland creatures are all so cute!! Another really great card! That is great. Love it!!! What a really cute card! 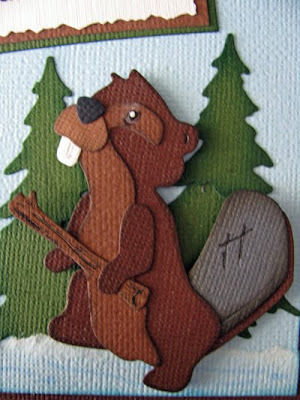 that is a cute beaver for sure! It's a SWEET Day at Scrapping Cottage!! !